We all want our Rottweilers to be happy and healthy. The fastest way to a happy and healthy dog is a healthy diet. 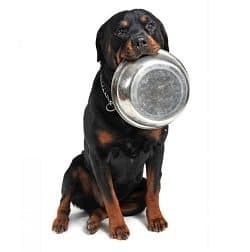 So what can you do to ensure your Rottweiler is getting the nutrition they need? Let’s take a look at what we can feed our Rottweilers. Rottweilers, and all dogs, are carnivores. That means they primarily eat meat. But when you look at a bag of dog food, you may find that the ingredients are primarily grains. This is because meat is expensive, and you can easily substitute meat with grains to cut down on the cost of manufacturing. Your dog should be consuming mainly meat in their diets to keep them healthy as well as to control their weight. Generally the cheaper the food, the more grains, preservatives, and chemicals are used in manufacturing. This does not always mean that the more expensive foods are necessarily better for your dog. Make sure you check the ingredients before making a decision on which dog food to purchase. But how can you tell which dog food is going to be the best fit for your Rottweiler? The number one ingredient on your dogs food bag should be meat, or meat meal. The ingredients should say something like chicken, chicken meal, herring meal, turkey meal, etc. If you want to feed your dog a proper diet, you should never feed them food that contains produced meals, soy, wheat, or corn. Your Rottweiler needs lots of protein in their diets. 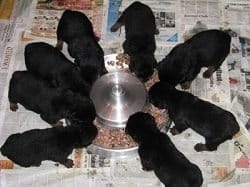 An adult Rottweiler should be served dog food that contains 22% to 26% protein, and a puppy should be served puppy food that contains 24% to 28% protein. A high protein diet will keep your Rottweiler from becoming overweight since the proteins are excreted through kidneys and not stored as fat. A puppy needs more protein in their diet because they are still growing and need the extra protein to develop muscles and build strength. 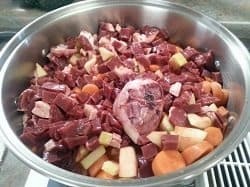 Your dogs food should contain only contain small amounts of fat and should never be listed anonymously as animal fat, but should appear as chicken fat, or beef fat. The healthy amount of fat content in your dog’s food should be around 12% to 16% for an adult Rottweiler, and 14% to 18% for a puppy. Just like with protein, puppies can consume a larger amount of fat than adults because they are still growing and have high energy. Fat does not equal substance anymore in a dog as it does in humans. If your Rottweiler eats foods high in fat, they will become overweight. Your Rottweiler’s food should never contain chemical preservatives, sugar, or artificial color. There is zero nutritional value for a dog in any of these ingredients. They can even potentially be harmful to consume. The benefits of feeding your Rottweiler a healthy diet are simple. They will be happy and healthy! In many more ways than one! When you feed your dog a healthy diet, they will be more energetic, have less health problems, and are less likely to become overweight. When you are not eating healthy, your energy levels drop. So if you are not feeding your Rottweiler properly, they will become sluggish and unenthused. Feeding your Rottweiler proper nutrition will result in a healthy, lean, energetic dog. If you are feeding your dog a healthy diet, their skin and coat will also look great. If they are not getting the proper nutrition they need, it will show through on the outside. Not only will you see that their coat lacks luster, but you may notice their skin flaking and their weight start to increase. Keeping your dog on a healthy diet can also prevent you from unwanted and unnecessary vet visits. If you feed your dog a proper nutritious diet, they will stay healthy, therefore costing you less on vet visits. If you are not feeding your Rottweiler properly, their health will diminish. Since Rottweilers are prone to obesity, it is not uncommon to see fat Rotties. But a fat Rottie is not necessarily a happy Rottie. When they are not getting healthy food in their systems, are over feeding them, or giving them too many treats, they can become very overweight. A fat Rottweiler is not a healthy one. When a Rottweiler becomes obese, they tend to become very lazy and unenthused. They may not want to play or exercise anymore. This is not good for your Rottie. They need to exercise and play so they can be happy and healthy. Also, there are several health hazards associated with obesity. The most important one being early death. A fat Rottweiler’s life expectancy is far less than a healthy lean one. When we overfeed our dogs, we are slowly killing them. The benefit of feeding your Rottweiler a healthy diet is a long and happy life.